The German Marzen and Oktoberfest beer styles are seasonal favorites of beer drinkers worldwide. This week we take a look at the traditional Marzen and Oktoberfest beer recipes and how to brew them at home. Thanks again for joining us on the BeerSmith Home Brewing Blog. 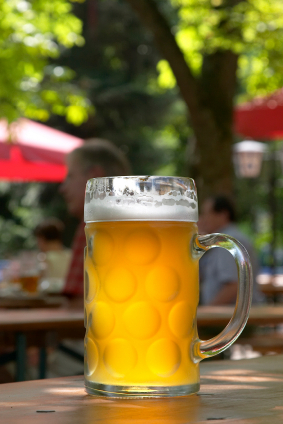 I hope you enjoyed this week’s article on the Oktoberfest beer style. If you get a chance, subscribe for regular weekly delivery via email or RSS. You follow up the post on seasonal brewing and planning with a post about Marzen beer…on November 1…. Yes, it is a bit ironic. I wrote the Marzen article some time ago, but posted it a bit later than intended. I have several #s of dark munich malt. Do you think this would be acceptable for a marzen as opposed to a regular munich malt? I personally would use regular Munich – the dark Munich malt is more appropriate for use in Dunkels and other dark German styles. Waving my resurrection wand .. Ryan, I completely disagree with Brad on this one. A local brewery in MT (Bayern) brews a phenomenal Octoberfest with the majority of the grain bill Dark Munich (a.k.a German Dunkel Malt). The head brewer is from Germany and has brewed at many german breweries in Munich and has multiple award winning beers. Also, I’d highly recommend reading the German Brewing Institute page on Marzens. Most of the homebrewing info I’ve found on Marzens/Octfests are based on the Americanized version and not the true German Marzen. Example: The original Octfests brewed in Munich had caramelized malts in them, but the BJCP guidelines say no caramel.